Does it have front fogs, and what's the maximum bhp I could can map it too? 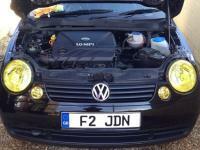 Would arosa seats go straight in a lupo? Any specific roof racks recommended? And I was looking at getting bbs reps what's size Is recommended? Anyone know where I could get my from bumper smoothed and roughly how much it would cost?